DYCZ-24DN is a delicate, simple and easy to use system. It is manufactured from high acrylic with platinum electrodes. Its seamless, injection-molded transparent base prevents leakage and breakage. This system is very safe for the users. Its power source will be turned off when user opens the lid. The special lid design avoids making mistakes. ■ High resolution separation with simple operation. ■ Weight: about 1.0 kgs. 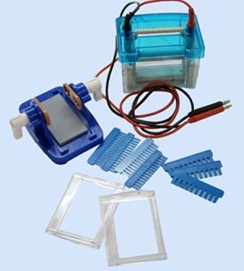 For SDS – PAGE, Protein Electrophoresis. DYY – 6C, DYY – 12.